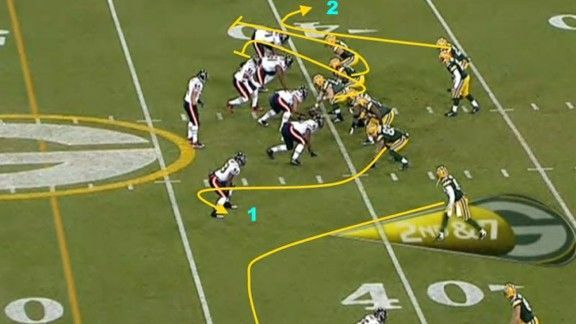 How modern offenses are rethinking the most fundamental elements of football "plays"
During the first quarter of last season’s Week 16 game against the Chicago Bears, Aaron Rodgers and the Green Bay Packers faced a second down with seven yards to go. The Packers were lined up in the shotgun, with two receivers and a tight end to the left, and a single receiver to Rodgers’s right. Rodgers took the snap and immediately looked to his left and set his feet to throw that way. After staring down the oncoming Bears defenders, he quickly turned back to his right and floated a screen pass to running back Ryan Grant. Following an envoy of blockers, Grant burst up the field before finally being tackled after a 32-yard gain. A few plays later, Rodgers threw a short touchdown pass to Jermichael Finley, and Green Bay’s 35-21 victory was in the works. Initially, the play appeared to be nothing more than a simple screen pass. Look a bit further, though, and it’s much more. That little toss to Ryan Grant was nothing less than a portent of the complete upheaval in thinking about modern play calling, and to understand why, we will start with a video game. And not just any video game. Still the greatest football video game of all time, Tecmo Bowl had an extremely basic but intuitive play-calling system. Each team had four plays to choose from on offense — usually two passes and two runs. There were also four choices on defense, but rather than choosing from the set of sophisticated coverages, blitzes, and fronts available in today’s games, players chose what play they thought the offense would run. If the guess was correct, the offense’s failure was preordained; the quarterback would be sacked or the runner tackled for no gain. If wrong, two of the options might only go for a moderate gain, but the third meant catastrophe for the defense. Admittedly or not, most fans think of real-world play calling as a slightly more complicated version of this “Tecmo Bowl model.” The offense’s job is to “keep the defense guessing,” and the defense must “guess right” to make a stop. On some level, even with their lengthy play sheets and reams of data, professional coordinators are engaged in a version of this same psychological battle, employing little more than educated guesses about the opponent’s tactics. Until recently, even the best, from Bill Walsh to Bill Belichick, have been playing what amounts to a complex game of Tecmo Bowl, improved only by the marginal differences coming in the form of various checks or audibles by the quarterbacks. Last season, Oklahoma State’s offense dominated nearly every defense on its schedule. Brandon Weeden & Co. averaged more than 48 points and 549 yards per game and finished third in the nation in yards per play. The Cowboys finished 12-1 — their best finish in school history — and closed the season with a shoot-out win over an Andrew Luck–led Stanford team in the Fiesta Bowl. The marquee players on offense were future first-round picks — Weeden would go to the Browns and receiver Justin Blackmon to the Jaguars — and each put up video-game-type numbers. Even with that duo, the Cowboys weren’t merely an air-it-out team. They averaged more than 160 rushing yards per game, and in last fall’s Bedlam game against Oklahoma, the Cowboys ran for 278 yards and four touchdowns en route to crushing their rivals, 44-10. At times, it seemed Oklahoma State could merely decide, at their whim, whether or not they would throw or run, regardless of the defense’s response. Oklahoma State’s favorite “run package” was to combine an inside running play, like the inside zone, with both a quick receiver screen to one side and an individual route to a singled-up Justin Blackmon. It made for a kind of three-on-one fast break adapted to football. Combining a receiver screen with a running play is not new, but it remains an important method to ensure that individual defenders play honest. If a linebacker or nickelback cheats in to stop a run, the quick screen to the outside equals free yards while punishing the defender for playing out of position. Once he is back in position to defend the screen, the running play has a better chance of success. What made Oklahoma State’s version of this system truly deadly was not only that Weeden could decide whether to run or throw, but where he could throw. Depending on how the defense played Blackmon, Weeden flashed him a signal to run a fade up the sideline or a quick slant underneath, putting pressure on an entirely different set of defenders. And it was up to Weeden — and the defense — to decide where the ball would go. It’s understandable that most fans (and even many coaches) think of football plays in terms of the strict run-pass dichotomy of the Tecmo Bowl model. Fantasy football is founded on the difference between passes and rushes, and even recent scholarly articles about football are built upon the distinction. And, at least on some level, the idea of “packaging” multiple options for the quarterback based on the movements of defenders is not entirely new. But the trend of combining entirely different categories of plays — runs and passes, screens and passes, runs and screens — is new, and these ideas are at the forefront of thinking about football. The challenge is undoing what we think a football play is without entirely disregarding fundamental, classic football thinking. One of the most interesting packaged concepts — and the play that’s helped many begin to rethink the very nature of a “football play” — is known as “stick-draw,” which combines a delayed run, or “draw” play, with the “stick” quick-passing concept. 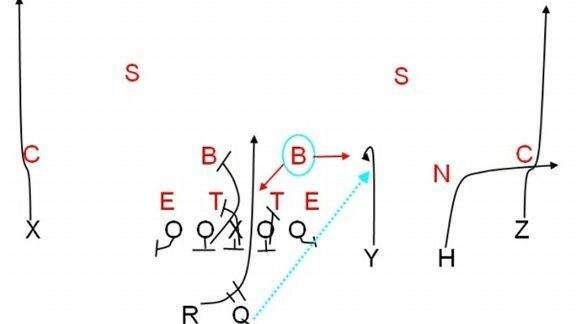 Grabowski is among the many who now use this simple little play, but the first coach I saw put it in action was Dana Holgorsen, the current head coach at West Virginia and Monken’s predecessor at Oklahoma State. Like all of the best package concepts, nothing about the play is particularly new. It’s the elegance of assembly that is important. The combination of plays is designed to focus on a key defender. In this case, it’s a linebacker, who stands as an unchecked threat to stop the draw and the quick inside pass route. One solution is the one Peyton Manning has made famous — calling an audible before the snap based on where that “key defender” lined up. The problem with that is we only care about what that defender does after the play begins. The better answer is to build the play itself around the key defender, and to read him. Enter the stick-draw. And packaged plays have hit the NFL, too. This brings us back to the Packers and Aaron Rodgers. On the play against the Bears that was discussed earlier, what had looked like a simple screen pass was actually a variant of the stick-draw; it was the “stick-screen” — a quick passing play combined with a running back screen. When Rodgers peeked to his left, he was not merely trying to draw the defense that direction. He was actually looking to throw a quick pass to his tight end. Because the man covering the stick, linebacker Lance Briggs, was taken completely across the field, the Packers had a significant numbers advantage to throw the screen. There would be no way to know how the Bears would defend the play based on their pre-snap alignment, and that’s why it’s the packaging and post-snap read that made it all go. The rise of “packaged plays” is important on its own, but it becomes essential when combined with the other trend in football — the up-tempo no-huddle. The no-huddle, especially when operated by quarterbacks like Rodgers or Tom Brady, is an invaluable weapon when combating modern defenses that rely on constant movement to maximize confusion. “In the no-huddle context, the advantage of packaged plays becomes particularly acute,” says Grabowski, adding, “An offense that can run these packaged plays at the fastest tempos can get a vanilla look that further simplifies the read on a key defender.” If you’re going to go fast-paced no-huddle to prevent defenses from substituting or setting up in something exotic, you have to do it, well, fast, and slow audibles with lots of words and gyrations at the line are not that. The rise of no-huddle offense means that these package plays will no doubt become more popular at every level, but the difference between this trend and other offensive evolutions is in how packaged plays represent a complete rethinking of the nature of the play. The Tecmo Bowl model has been the dominant model since long before Tecmo Bowl, but this new approach is an opportunity to take the old, trusted tactics and adapt them for the modern game. And, as Grabowski points out, we’ve only just begun: “The only limits to packaging plays seems to be a coach’s creativity in finding different ways to make a single defender wrong, every time.” The innovation here is seemingly small but the advantage is huge: Like some obnoxious friend, quarterbacks are now looking over your shoulder, watching to see which buttons you’ve pressed before selecting their play. Get used to it. One of the most interesting aspects of these concepts is the effect on the offensive and defensive lines. Although the offensive line is able to block the run play — and doesn’t have to pass block, thus avoiding one of football’s toughest tasks — unblocked defensive players don’t pose much of a problem because they are reading the offensive linemen, and as a result, don’t rush. Watching these clips, you rarely saw defensive linemen get in Weeden’s face even when unblocked. One concern raised by these plays is with linemen getting illegally downfield, but this is not a real problem. There is more wiggle room here than most realize. In college, linemen are allowed to be three yards downfield on pass plays, while in the NFL they get a full yard. Further, the passing components in these plays are so quick that there is little risk a lineman will get illegally downfield. Lastly, it’s worth noting that I’ve simply never seen a penalty for a lineman downfield on one of these packaged plays. Indeed, for years NFL teams have been putting a quick “look” pass — either a hitch or slant route — on the backside of run plays. This is just taking the next step. See here for additional video of stick/draw and other packaged concepts.